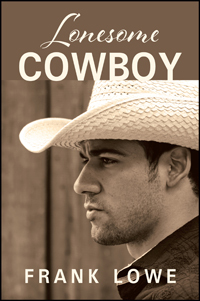 Frank Lowe’s “Lonesome Cowboy.” Tenacious and talented Kyle Kelly holds on to his dream of becoming a famous country-western singer. He falls in love with Miranda, a waitress in a Mexican restaurant. In this thrilling and heartfelt story, instead of marriage plans, Kyle finds himself a target of Mexican forces who are determined to keep them apart.